I've moved back to using carbon pencil. The brand I use is Conte, which last year became unavailable in Canada, to the horror to a handful of us carbon junkies. When I was in Florence last October I spent over 100 Euro on them, and had to haul them around the rest of the trip with me. Recently I've heard rumours that they are available here again, but it was worth it anyway. Now those pencils are precious to me, and makes me add pressure to myself to not waste them by creating less than incredible work. Carbon is a fantastic medium to work with. The Conte brand has the consistency of charcoal and pencil crayon combined; the slight waxiness allows both subtle gradations and rich darks to be laid down easily. I use the 2H for the lighter tones, it is an extremely hard pencil and it great for ghosting in my big forms. I switch to the 2B to finish the drawing with the darkest darks. Using coloured paper with the carbon and some white charcoal for accents is an old favoured technique made famous by Pierre Paul Prud'hon (1758-1823), and gives a must wider range of tone than using graphite alone. This magical combination of elements has made me fall even deeper in love with the pure qualities of drawing. 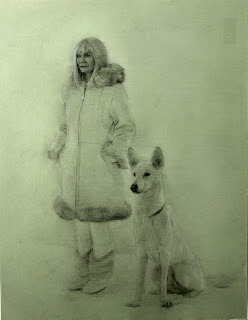 Here is the study drawing for my "White" painting. I really wanted to capture the haunting quality of the image, so allowed much of the green of the paper to show through. This gives a unity to the drawing, allowing the figures to become part of their surrounding environment and vice- versa. I chose these poses of Carol and Linux the dog because of the pure strength of them, a hard beauty that is both regal and honest, qualities that I hope will shine in the final painting. Beautifully rendered drawing. 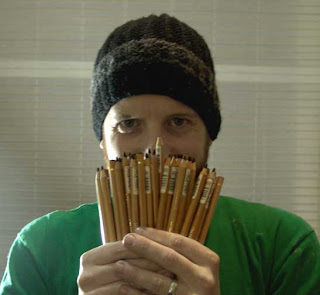 Never worked with Conte pencils, but am going to see if I can find a source and try them. I found your art through Gandalf's Gallery. The portrait of Kelly Grace was a stand-out, even in the context of that visually stunning blog. Looking forward to future work. Regards.